No, this time it isn’t satire and yes, I do acknowledge that these days it’s very hard to tell! When I wrote about Noam Chomsky’s idea that the best place to get the truth in the newspaper was on the business pages, a few people argued that those capitalist lackey running dogs had the sort of views that were responsible for all that ails the world. However, I wasn’t suggesting that it was their viewpoints that were worth reading. It was what they revealed about what was actually going on. ‘Twice in three years, the Wangan and Jagalingou (W&J) had rejected Adani’s advances to sign a land deal for the mine, and twice Adani had dragged them off to the Native Title Tribunal and sought approval for the state to override their opposition to the mine. Apparently, the Chinese have started testing for fluorine and phosphorus, as well as the traditional tests for sulphur and ash, and this led to a boat load of Australian coal (yes, from Newcastle!) being sent back. However, “The Age” seemed to be suggesting that was no “environmental” reason for rejecting the coal and there was an ulterior motive in China’s decision to test for fluorine and phosphorus telling us that it was to protect struggling Chinese coal miners. 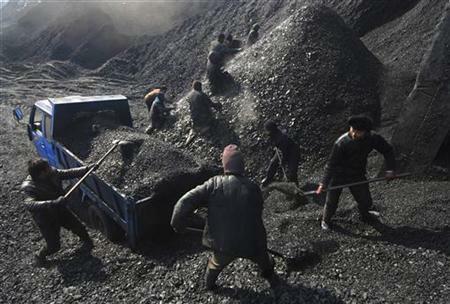 “I think the environment issue is a secondary reason, the most important issue is that China’s coal market over-supply is too serious,” ICIS China energy analyst Deng Shun was quoted as saying. Mm, perhaps Mr Abbott is pinning his hopes for future markets on lots and lots of naughty boys and girls getting a lump of coal in their Christmas stocking. Yesterday, I made a typo in my heading, but I was comforted to see that “The Age” was doing its bit to make me feel like everyone needs proof readers. In an article on Greece, they had a sub-heading about a “Phyrric Victory” which then went on to talk about a “Pyrrhic Victory”. Well, we all make mistakes, I thought. But it was their Editorial demanding a “conscientious” vote on gay marriage that concerned me. Given that “conscientious” means thorough, careful and vigilant, one would hope that all votes in Parliament are “conscientious”. Ok, perhaps they just meant that this one demand special care and vigilance, but I suspect that they really meant “conscience”. Brilliant. Some of your blogs (and Kaye Lee’s ) would be at home in the Saturday Paper . You give me hope Rossleigh that ‘truth’ will once again grace the pages of the MSM. It only takes one turn back. I’m surprised we are allowed to know about it. Wouldn’t it be classed as an “On Water” matter?